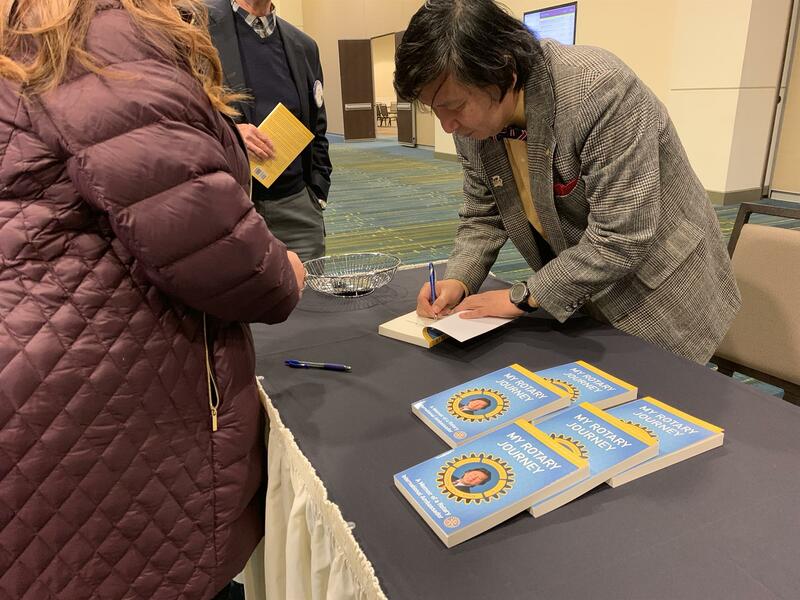 Rotary Ambassador, Author and Rotarian Woodrow 'Wooj' Byun spoke Monday Nov 26 to all the Cedar Rapids area Rotary clubs hosted by the Downtown Rotary at the DoubleTree Hotel. In 1990 Woodrow 'Wooj' Byun was from a family of meager means and applied for and was granted a Rotary International Ambassador Scholarship from his Korean hometown Rotary club with the hope of attending a US law school. He was accepted by several law schools and selected the U of Minn.
Later when he finally was able to swim the financial waters, he thought he should repay Rotary for the scholarship so others could do the same. Called 1-800-Rotary (<dont quote that number>) and said he wanted to repay the loan. The staffer in Evanston said no one has ever done that. She suggested he join a Rotary club instead and see how he could find a way to repay that way. -In 2008 he came up with the idea for a concert on behalf of a young man he'd met who struggled with his congenital birth defect with only 1 finger on each hand. The concert featured Korean pianist Hee-ah Lee who had a similar congenital defect. Within a month he had to raise $15,000 to be able to bring Ms Lee, her mother, and her caretaker to be able to put on the concert. The young boy - now in high school - on whose behalf Wooj was hoping to encourage was able to attend the concert with his family and was invited on stage at the end. Hee-ah Lee was a guest at the Edina Rotary club meeting before the concert... her visit was captured in this 2 minute video, broadcast locally in the Twin Cities, then on CNN leading Hee-an Lee to become world renowned. -In 2011 Wooj attended the Rotary International conference in New Orleans. Bill Gates had already challenged Rotarians in 2008 to raise $100million as a match to Gates' Foundation and to double the Rotary challenge for another $100million in 2009 for Gates $250 million. Gates spoke at that 2011 conference and after shook hands with Wooj. In yesterdays presentation Wooj explained from the Gates meeting he decided he had two mortgages... his house mortgage and a $2 million mortgage to the foundation on the $23,000 scholarship he received from Rotary.... a mortgage he will be paying on for some time. Proceeds from his book "My Rotary Journey: A Memoir of a Rotary International Ambassador" will help to pay that mortgage. It is available online at Barnes & Noble and Amazon. And likely at a Rotary meeting at the Edina MN Rotary club.